The Chief Minister of Telangana for the NCERT 55th Council Meeting in Delhi on Wednesday,Education Minister Kadiyam Srihari attended.To this meet for all State Ministers of Education,Officials also attended.The meeting has been proposed to study the training of teachers across the country.Union Minister Prakash Javadekar appointed Kadiyam Srihari as the chairman of the committee. 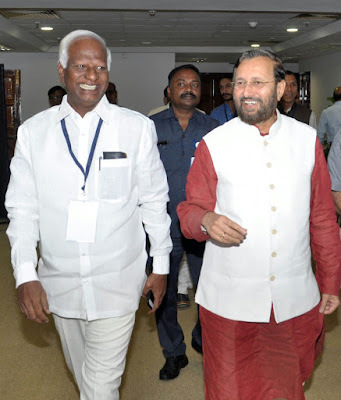 The details of the meeting Kadiyam Srihari explained to the media.Schemes for the Department of Education on behalf of the State Government,New programs,The state proposals sent to the Center explained.He also made suggestions on child education to the center. Minister Srihari thanked the center for Kasturba Gandhi Girls' Colleges extending the 12th class.Due to the expansion of KGBs to Class XII To prevent child marriages,He said that this will help increase the education of girls.NRECR has made many suggestions for Telangana.The Center has asked to start pre-primary schools across the country.Telangana 12 thousand Anganwadi centers schools was establishing.Midday meal scheme,The school uniforms have been asked to cooperate with up to 12th class.Sarva Shikshana Abhiyan, RMS and a teacher training are all in conjunction with a comprehensive Penal Abhiyan scheme.20 percent of the budget has gone up for Education.The Union Minister said that the next year will increase by 20 percent.Srihari explained that all districts across Telangana have been asked to set up Diet (Destructive Institution of Education and Training) centers.